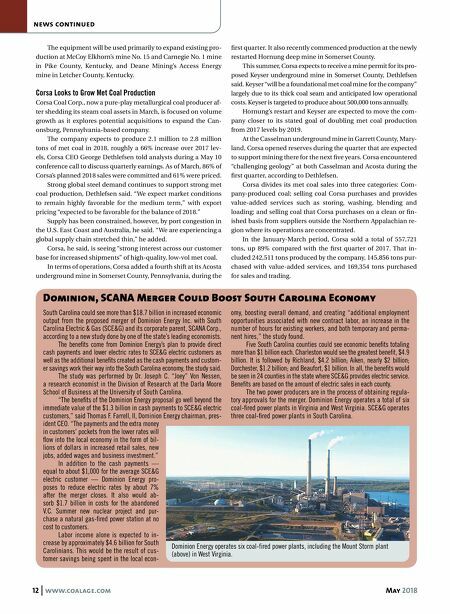 12 www.coalage.com May 2018 news continued Dominion, SCANA Merger Could Boost South Carolina Economy South Carolina could see more than $18.7 billion in increased economic output from the proposed merger of Dominion Energy Inc. with South Carolina Electric & Gas (SCE&G) and its corporate parent, SCANA Corp., according to a new study done by one of the state's leading economists. The benefits come from Dominion Energy's plan to provide direct cash payments and lower electric rates to SCE&G electric customers as well as the additional benefits created as the cash payments and custom- er savings work their way into the South Carolina economy, the study said. The study was performed by Dr. Joseph C. "Joey" Von Nessen, a research economist in the Division of Research at the Darla Moore School of Business at the University of South Carolina. "The benefits of the Dominion Energy proposal go well beyond the immediate value of the $1.3 billion in cash payments to SCE&G electric customers," said Thomas F. Farrell, II, Dominion Energy chairman, pres- ident CEO. "The payments and the extra money in customers' pockets from the lower rates will flow into the local economy in the form of bil- lions of dollars in increased retail sales, new jobs, added wages and business investment." In addition to the cash payments — equal to about $1,000 for the average SCE&G electric customer — Dominion Energy pro- poses to reduce electric rates by about 7% after the merger closes. It also would ab- sorb $1.7 billion in costs for the abandoned V.C. Summer new nuclear project and pur- chase a natural gas-fired power station at no cost to customers. Labor income alone is expected to in- crease by approximately $4.6 billion for South Carolinians. This would be the result of cus- tomer savings being spent in the local econ- omy, boosting overall demand, and creating "additional employment opportunities associated with new contract labor, an increase in the number of hours for existing workers, and both temporary and perma- nent hires," the study found. Five South Carolina counties could see economic benefits totaling more than $1 billion each. Charleston would see the greatest benefit, $4.9 billion. It is followed by Richland, $4.2 billion; Aiken, nearly $2 billion; Dorchester, $1.2 billion; and Beaufort, $1 billion. In all, the benefits would be seen in 24 counties in the state where SCE&G provides electric service. Benefits are based on the amount of electric sales in each county. The two power producers are in the process of obtaining regula- tory approvals for the merger. Dominion Energy operates a total of six coal-fired power plants in Virginia and West Virginia. SCE&G operates three coal-fired power plants in South Carolina. The equipment will be used primarily to expand existing pro- duction at McCoy Elkhorn's mine No. 15 and Carnegie No. 1 mine in Pike County, Kentucky, and Deane Mining's Access Energy mine in Letcher County, Kentucky. Corsa Looks to Grow Met Coal Production Corsa Coal Corp., now a pure-play metallurgical coal producer af- ter shedding its steam coal assets in March, is focused on volume growth as it explores potential acquisitions to expand the Can- onsburg, Pennsylvania-based company. The company expects to produce 2.1 million to 2.8 million tons of met coal in 2018, roughly a 66% increase over 2017 lev- els, Corsa CEO George Dethlefsen told analysts during a May 10 conference call to discuss quarterly earnings. As of March, 86% of Corsa's planned 2018 sales were committed and 61% were priced. Strong global steel demand continues to support strong met coal production, Dethlefsen said. "We expect market conditions to remain highly favorable for the medium term," with export pricing "expected to be favorable for the balance of 2018." Supply has been constrained, however, by port congestion in the U.S. East Coast and Australia, he said. "We are experiencing a global supply chain stretched thin," he added. Corsa, he said, is seeing "strong interest across our customer base for increased shipments" of high-quality, low-vol met coal. In terms of operations, Corsa added a fourth shift at its Acosta underground mine in Somerset County, Pennsylvania, during the first quarter. It also recently commenced production at the newly restarted Hornung deep mine in Somerset County. This summer, Corsa expects to receive a mine permit for its pro- posed Keyser underground mine in Somerset County, Dethlefsen said. Keyser "will be a foundational met coal mine for the company" largely due to its thick coal seam and anticipated low operational costs. Keyser is targeted to produce about 500,000 tons annually. Hornung's restart and Keyser are expected to move the com- pany closer to its stated goal of doubling met coal production from 2017 levels by 2019. At the Casselman underground mine in Garrett County, Mary- land, Corsa opened reserves during the quarter that are expected to support mining there for the next five years. Corsa encountered "challenging geology" at both Casselman and Acosta during the first quarter, according to Dethlefsen. Corsa divides its met coal sales into three categories: Com- pany-produced coal; selling coal Corsa purchases and provides value-added services such as storing, washing, blending and loading; and selling coal that Corsa purchases on a clean or fin- ished basis from suppliers outside the Northern Appalachian re- gion where its operations are concentrated. In the January-March period, Corsa sold a total of 557,721 tons, up 89% compared with the first quarter of 2017. That in- cluded 242,511 tons produced by the company, 145,856 tons pur- chased with value-added services, and 169,354 tons purchased for sales and trading. Dominion Energy operates six coal-fired power plants, including the Mount Storm plant (above) in West Virginia.